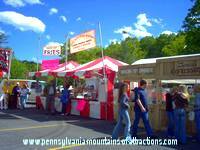 Spring arrives in Central Pennsylvania with the traditional Blair County PA Arts Festival at Penn State Altoona Campus. 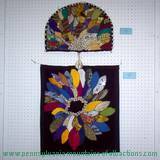 You'll see juried art displays, PA crafters, and all types of artistic entertainment. No matter what entrance you choose at the Penn State Altoona Campus, you'll quickly find yourself interacting with some type of artist in action. Blair County's Arts Foundation is well known across Pennsylvania for its brilliant artists, unique crafters, and musical entertainers. 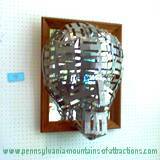 Stroll through the Penn State Altoona Art Center and see all the beautiful forms of art on display. Here you'll see every form of art imaginable. 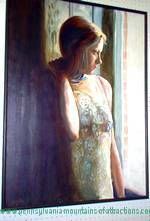 You'll find oils on canvas, water paintings, sculptures, ceramic, quilts, customs, and 3-Dimensional forms of art. 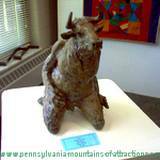 Every piece of art that is on display at the Blair County PA Arts Festival is juried for prizes and recognition. Many of the artists are present throughout the weekend to discuss their work and answer any questions. Here you'll find many of Blair County's popular artists and many talented artists that are just being discovered. Each piece of art is entered and judged for talent and uniqueness before being put on display. This is how the Blair County Arts Foundation has such a wide variety of art forms to make sure all visitors find something of interest. All artwork is offered for sale, who knows, you just might invest in the next priceless piece of art! Taking a stroll through the beautiful Penn State Altoona Campus anytime is an experience. When you combine the stroll around the lake with Artists in Action it's an interactive memory for the entire family. 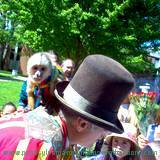 Adults are as enchanted as the children when they find themselves shaking hands with a little monkey that seems to be having as much fun as you are. Meet Hubie The Clown and watch him twist his famous balloons into just about any kind of animal you heart desires. 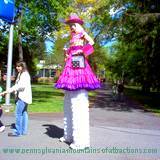 Shake hands and chat with the cowgirl lady on stilts. Watch your child's eyes light up as she bends way over to shake their hands. Around every bend and curve you'll hear musical entertainment, squeals and laughter. Let your children interact with the many artists and make some crafts, spiral paint, or get their faces painted. Watch the canoe races on the lake. Feed all the ducks while you rest and unwind. 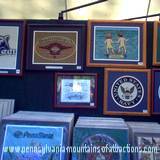 Of course it wouldn't be a true PA Festival without an array of unique craft booths. 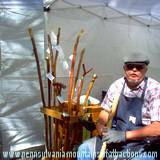 At the Blair County PA Arts Festival all crafts that are sold from the many craft booths are also juried and given awards and recognition. Which means each craft booth will be unique with artistic crafts for you to buy. 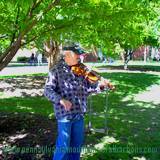 Stroll from one end of the Penn State Altoona Campus to the other and you'll hear various types of music playing. You'll enjoy hearing different school performing band music, at another location you'll hear Gospel music, County and Western music, and one of may favorites The Irish Performers. 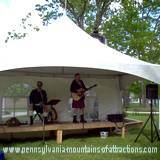 The Irish Performers will have you giggling and tapping your feet. They love to improvise the lyrics as they perform their favorite Irish songs. Visit the Gym and enjoy the display of artwork done by school children. You'll find an endless display of different forms of art, all done by children through Blair County. Pennsylvania is known for its many different heritages and ethnic foods. At the Blair County PA Arts Festival you'll enjoy tasting many different types of food, snacks, and drinks that has made PA's ethnic food so popular. You'll find treats like hand dipped chocolate strawberries, sweet kettle corn, and hand-dipped ice cream from the Penn State Creamery. You can enjoy a meal of sirloin tip kabobs, jumbo turkey legs, cactus fries, or German kaluski., the menu is endless. Enjoy it all in Central Pennsylvania, every May. 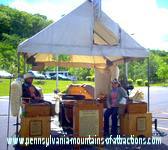 Join the fun and explore The Annual Blair County PA Arts Festival. If you're an artist or like to create homemade crafts check out this festival, you just might be displaying your art next May!